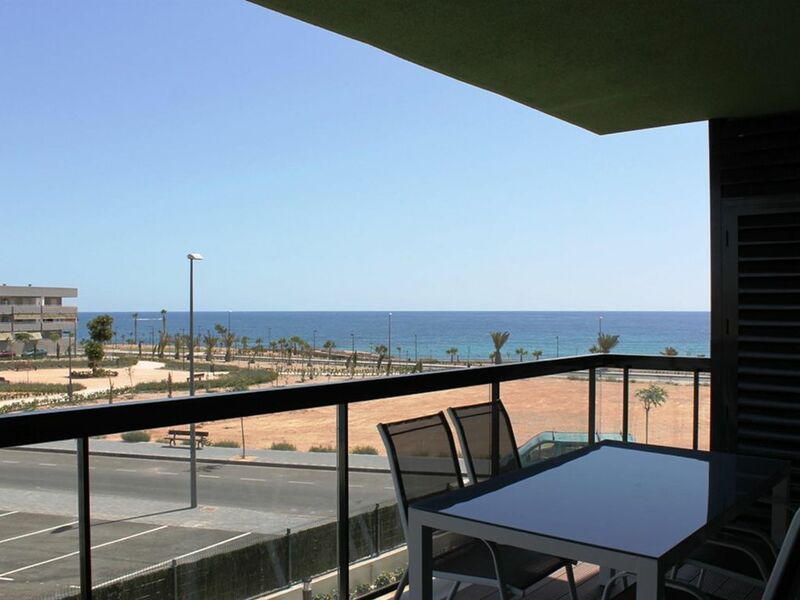 Newly built apartment by the sea in Torre de la Horadada (Pilar de la Horadada) - Alicante, Costa Blanca South. Located 100 meters from the sea, you can enjoy breathtaking views from its large balcony (17 m2). You can also use any of the pools and playground installed in areas of the community. Torre de la Horadada is a nice little town with 300 days of sunshine per year on average, so you can enjoy long walks through the promenade, cycling and, of course, its magnificent beaches of fine sand and crystalline waters. It is very easy to reach the Torre de la Horadada. It is 10 minutes from San Javier - Mar Menor airport and 45 minutes from Alicante airport. The highway leaves him just 500 meters from the apartment. Modern, new apartment just a few minutes walk from the beach. Sehr schönes Apartment mit seitlichen Meerblick, mit einer großen Poolanlage, mit festen Sonnenschirme aber leider ohne Liegestühle, auf dem Balkon ist eine Sonnenliege aber leider keine Sonne mag im Hochsommer ganz angenehm sein, die Schlüsselübergabe beim Check in und out hat reibungslos funktioniert, verschiedene Strandabschnitte sind gut zu Fuß erreichbar, war eine sehr angenehme Urlaubswoche. Leuk appartement, mooi uitzicht op de zee en heerlijk balkon met (helaas) alleen ochtendzon.